My father, rest his soul, and I bought Triple Threat together sometime in the mid-’80s. We raced our ’81 Pearson Flyer hard together for the next 15 or so years, including 12 Port Huron to Mac races. The purchase date is lost to history, but the details surrounding how many times the boat needed a new bottom—meaning a new epoxy barrier coat—are forever etched in my psyche. It’s all the sanding that accompanies repairing gelcoat blisters that has addled my IPA soaked cranium. One just doesn’t forget those seemingly endless hours of self-imposed torture. Gougeon Brothers, Inc. Because I’d been racing sailboats since the late ’70s, I was friends with many of the guys who worked for GBI at the time—J.R. Watson and Joe Parker not to mention Meade and Jan Gougeon—and they had already converted me to the virtues of WEST SYSTEM Epoxy. Even though the Flyer had only 200 hours of use when we bought it, it had been stored indoors at the marina for a number of years and showed absolutely no signs of blistering, I knew I should apply a barrier coat before it ever hit the water. Boats built in the era when mine was built tended to blister much more than more “modern” boats, that is, production boats generally built after 2000. This is mostly due to changes in building techniques and materials. Many, but not all, production boats built today apply a vinylester barrier coat at the factory under the gelcoat to prevent the blisters that plagued many earlier production fiberglass boats. Around ’85 or ’86 we long-boarded the gelcoat, exposing nearly all of the laminate, and then rolled and tipped six coats of 105 Resin/206 Slow Hardener. We started on the starboard bow with one of us rolling and tipping and the other mixing the epoxy and 422 Barrier Coat Additive to keep the supply in the rolling pan fresh. We traded places when the arms of whoever was applying the epoxy couldn’t take it anymore. 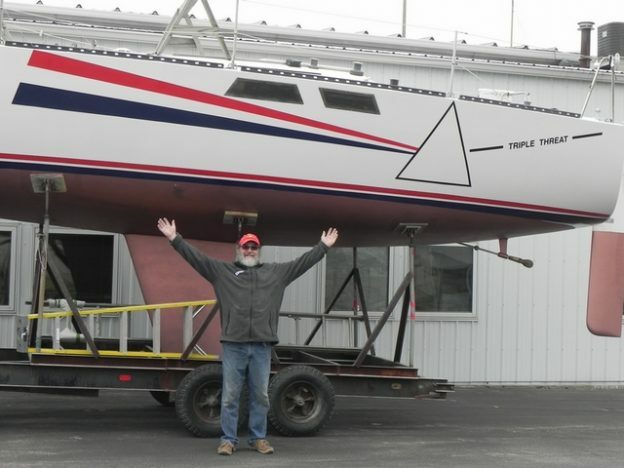 It was about 80°F and sunny, which allowed for six trips around the hull and keel non-stop. In the time it took to get back to where we’d started on the starboard bow, the epoxy was tacky and ready for recoating. I won’t kid you, it was a long day. But it was only one long day and we only had to sand the hull once to prep for the bottom paint. If we had to stop for any reason before all six coats were applied, we would’ve had to sand before completing the application and still sand again to prep for painting. 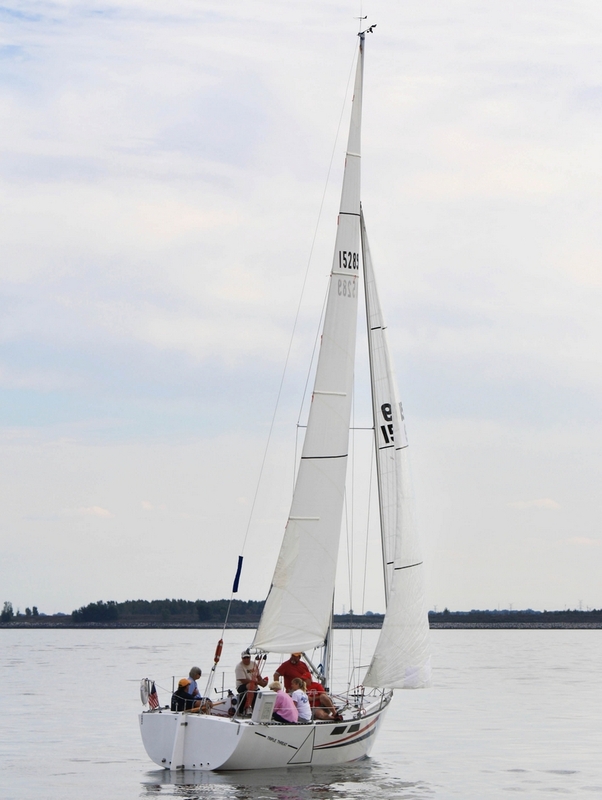 Bruce races Triple Threat weekly in a Wednesday night series on the Saginaw Bay. The initial barrier coat applied to the dry hull in 1986 lasted about 8 to 10 years before a growing number of small, pencil-eraser sized blisters appeared when I hauled out, and under the pads after a winter on the hard. Actually, getting 8 to 10 years life from a barrier coat in the Great Lakes is phenomenal! Most yards up and down the three coasts (that’s right Fifi—Michigan has more coastline than either the East or West coast) offer a two-year warranty on workmanship only, meaning if the whole barrier comes off in sheets or the bottom paint doesn’t stick to the new bottom, they’ll fix it. I’ve heard some offer a warranty as long as five years. Warranties generally cover the repair of isolated blisters if they show up during the warranty period, but if you can get them to apply a new barrier coat, you’re a better man than I. Most people in the repair industry do not expect a barrier coat on an old boat to last more than a couple years without some blisters reappearing. I have answered a number of calls over the years when a customer learns about the reality that blister jobs are not permanent. They are a bit freaked out that a yard might charge several thousand dollars for work with a two-year stated life expectancy. While epoxy has proven to be the best moisture barrier available, it is not moisture-proof. Moisture will eventually work its way through. For this reason, and for the best long-lasting results, it’s important that your hull laminate is dry and structurally sound. As you might have guessed, sometime around ’96 or ’97 I began to see the return of isolated areas of small blisters in the bow area and in the stern. I learned an important lesson from Joe Parker around this time: blister formation can be augmented by moisture that originated from inside the boat. The bow is where my sail lockers/bins are and they sit against the hull holding in moisture that then gets forced through the laminate. In the stern, where the engine is mounted, there are a few decade’s worth of engine oils and grime coating the inside laminate surface, again working to force any moisture that may have seeped into the laminate through osmosis towards the outer surface and causing blisters. Having taken a patchwork approach to blister remediation for a few years, my father and I again tackled the project of sanding off every last bit of bottom paint with 60- to 80-grit paper, applying six more coats of 105/206, re-sanding for fairness with long boards, and applying new anti-fouling paint. Just like the first time. Now here we are in 2018, twenty years since my last barrier coat. I’ve been taking that patchwork approach I mentioned for three or four years…or more. I arranged to go in the GBI boat shop for a couple months around the first of the year and apply THE LAST BARRIER COAT I’LL EVER PUT ON TRIPLE THREAT! EVER. EVER. I’m getting too old for all this… manual labor, crawling in and out of the cradle, up and down ladders, and sanding upside down until every bone in my body aches!…nonsense. I’m going to want beer—and lots of it! Featured photo: Triple Threat in front of the Gougeon Brothers boat shop, ready for a great season of sailing.